The rather large list of Exhibits gives you an idea of the lengths to which NDTV and PC would go to save themselves. It has been a war between two equals so to say. Both the adversaries are highly educated and seasoned professionals. And both are wealthy. If they have been at war for over two years…, it’s only because their mindset is poles apart. On one side he has been a soft-spoken and sophisticated man. Born in Calcutta 69 years ago, he was schooled in the famous Doon and La Martiniere, before getting a scholarship for higher studies in the United Kingdom. There he qualified as a Fellow of the Institute of Chartered Accountants (England and Wales); he also has a Ph.D. in Economics from the Delhi School of Economics. Curiously, and uniquely, he and his journalist wife, Radhika Roy, were the first, in 1989, to set up a television news production company called New Delhi Television (NDTV) where, incidentally, he became popular, again uniquely, as a Psephologist and as India’s Financial Budget analyst. After years of producing the news for Star News, Dr Roy launched his own broadcasting network with NDTV 24×7, NDTV India and other channels in 2003. NDTV has set up benchmarks for good, ethical and no-frills news coverage. Note the word “ethical” in the last sentence above. That was the word latched on to by another brilliant man who was born in Chennai and settled down in the USA from 1985. A Masters in Computer Engineering from Colorado State University, he turned a prolific inventor, securing 37 patents in the areas of Hardware, Software, Encryption, and Systems. From an inventor, he became an entrepreneur, who after starting to write in a money magazine in 2015, started a news portal, PGurus.com, of which he is the Managing Editor, writing, editing, interviewing and supervising over a publication which today has a circulation of 6,00,000 per month. Already, he has been the author of four books (i) “NDTV Frauds”; (ii) “The Gist of GSTN”; (iii) “The Rise and Fall of AAP” and (iv) “C- Company”; one of which has been made it to the top sellers list of Amazon Kindle. All of it is curious and unique, almost historic. Salute this courageous, “out of the box” thinker who has taken on NDTV and its several powerful political and bureaucratic supporters. Yes, salute Sree Iyer, now aged 57 years. His first version of “NDTV Frauds” in March 2017 received a lot of praise. By February 2018 its entire print edition was sold out and the book had run out of print. 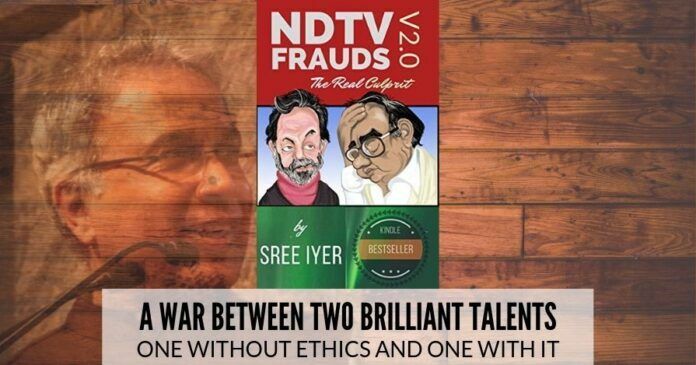 Since its first publication in March 2017, a lot had happened that vindicated the contents of the diabolical NDTV frauds described in the previous version, particularly in concert with complicit Indian Revenue Service (IRS) officers patronized by political class of the day, notably the then Finance Minister Palaniappan Chidambaram (PC) and his friends in the changed political dispensation. All these were incorporated in the 2nd edition of the book as new and additional chapters. The rather large list of Exhibits gives you an idea of the lengths to which NDTV and PC would go to save themselves. (xii) False claim of sexual assault. Readers, get titillated, terrified and traumatized by the above if you haven’t experienced all that before. why MODI govt not taking any aggressive action against NDTV and other anti nationals? Arvind L, Satya and Sree Iyer could write Columns and Columns but the world goes around as is without any major chnages. When the sweet immortal Nectar comes out of Churning with it comes, the Poison too. Remember, Good and Bad are intertwined in this world. Generation, Organization and Destruction keeps On Going to maintain Equilibrium. Ravana, Kumbakarna, Sishupal and Kams are creation of the Divine. Prannoy Roy-Radhika, P. Chidambaram-Karti, Sonia-Rahul are also part of the same creation come to play their roles, get the highest education, big time money, fame and the power that comes with it to rule and lead going ever strong. People do turn to NDTV, listen to the vast team of smart men and women they have employed to work for them. By the same count, one Can’t say Modi e tal and his team of BJP/RSS Cadre are dedicated, honest, selfless patriotic Indians. Modi could not have captured the power at the Centre without the help of Adhani and Ambani and Arun Jaitley working to put him at his Delhi office. The failed Australian coal mining deal [for Adhani] and the Rafale deal [for Ambani] stand as testimony that Modi has his paybacks to do besides following the directives of Arun J… to go slow/stall the C-Company cases going to Court. The fights between the Right and the Wrong, Good and the Bad has been going for ages. Is S.C. Bose right or the Gandhian approach correct? Who truly got the Freedom for India from the Brits? Aurobindo Ghosh retreated to solitary in a far off Pondicherry, far from the madding crowd of Kolkatta. Corruption is part and parcel of the way of Life of Indians. The Cream and Elite of India that comprises of: TOP Netas, Top Bureaucrats, Top Lawyers, Top Judges, Top CAs, Top Physicians who come up come to the Top by compromising the human values. There are so many highly rated smart, patriotic lawyers. However, you need a Karunanidhi, Jayalalitha, Lalu Yadav, Arun Jaitley or P. Chidambatam working for you to be PLANT one as an HC Judge and then move up the rank from there. This is how India has worked post-independence. It is for Prannoy, Radhika, Arun Jaitley, Modi and P. Chidambaram, Nalini to ask the question to themselves, speak to their own Conscience and find a solution between the right and wrong. It is not that easy to take the path of renunciation like Aurobindo Ghosh. We are all caught in the wheel of web like a cob running aimlessly, thinking we are right.